But still: Compared to the, at times extraordinary medium block, Shakhtar’s higher press is noticeably worse. One important aspect to this is that you almost can’t be as compact when you press in the opponent’s half as in a medium block because the offside rule is only applied from the halfway line downward. Many of the pressing patterns are implicitly based on the players being close to each other. Such situations need to be created differently in the opponent’s half than in the deeper pressing (e.g. situational compactness versus general compactness). 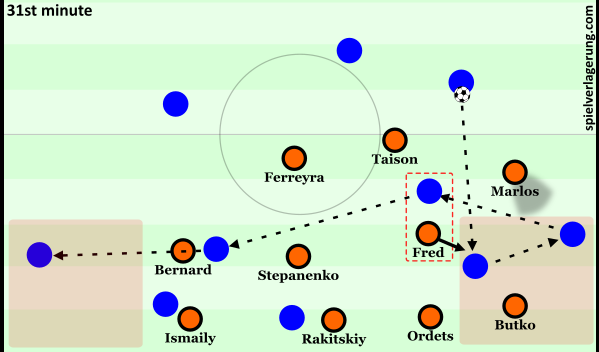 Even in their own half the sometimes-forceful forward defending of Fred can be used against Shakhtar when he follows a dropping moment for a short moment and Marlos is rather focused on keeping the winger in his cover shadow. Then both of them neither block the passing lane through the half-space nor is the team ready to create the usual staggering in reaction to a pass into this area. This can already become problematic in small spaces against strong opponents. On one hand, a 2vs1 on Butko could easily be created, if he doesn’t step up. If he does, the timing and the direction of him attacking the ball need to be good enough to prevent a pass towards the wing and consequently lead to an easy breakthrough. Butko can be quite successful in this, but more when a pressing situation is pre-planned rather than a result of not executing the plan perfectly. On the other hand, Fred is relatively quick to react to such small mistakes and can compensate them thanks to his individual intensity. As a result, the player he previously marked might become the free player for an immediate back pass from the wing. He can’t be attacked as soon as needed, then, and is able to switch towards the other side where the opponent could use a dynamical or individual advantage to break through. 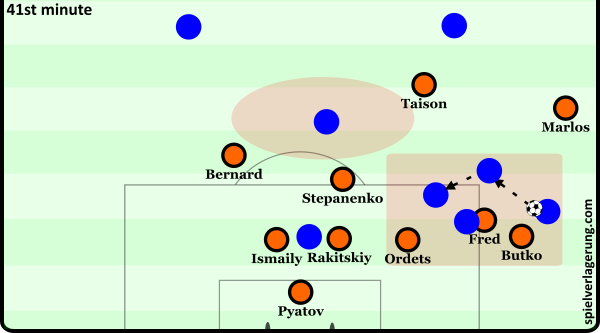 Although Shakhtar defends switches of play quite well overall, with bigger space between the defending players the advantage on the near side could already be used much easier by the opponent. 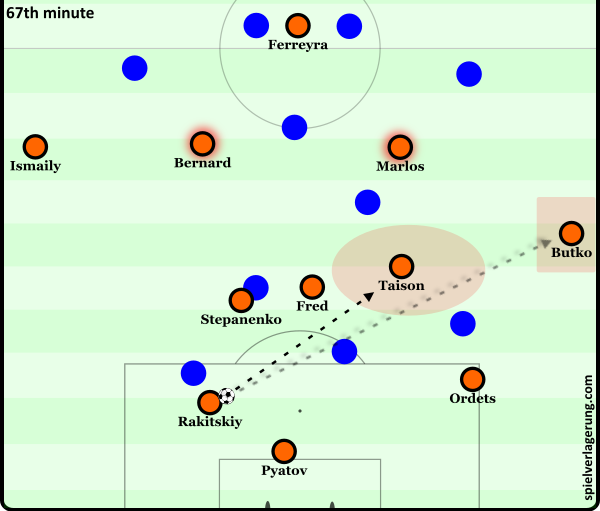 The compactness missing in other moments can become too much in situations where the ball is on the wing, right at the edge of Shakhtar’s own third. This can also have an obvious negative impact that all opponents in the Champions League group stage used to their advantage in order to create dangerous situations close to the penalty area. Even on the far side, the back four tries to position itself as high as possible and as close to the midfield as possible. If the opponent makes a run into depth in the ball-near half-space, the nearby centre-back tends to follow this movement because employing an offside trap would be quite risky as the opponent’s run already starts 10 to 15 metres away from the back four. So, for a short moment the ball-near centre-back is positioned deeper than the other defenders. If there’s not enough pressure on the player in possession of the ball on the wing, an easy pass behind the back line can be executed. Thus, a late run of a centrally positioned player (mostly the striker), can beat the whole pressing action. 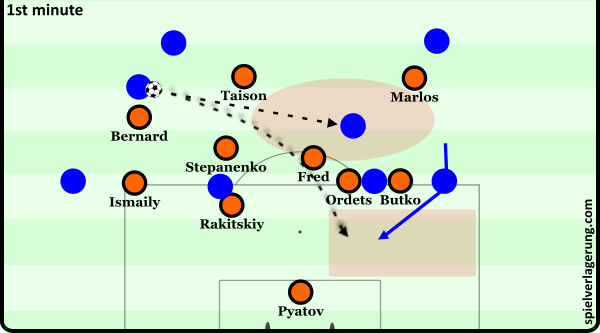 Once the ball reaches an area surrounding Shakhtar’s own penalty area, at least the rear part of the team tends to drop back quickly while other players stay in positions higher up the field for possible counter attacks. Fred again moves far away from the centre to press the ball or to support his team mates. Stepanenko now needs to evaluate whether he should do the same close to his own goal or whether he should continue to protect the centre. Based on this decision he either allows the opponent to have a numerical superiority at the edge of the penalty area or the backfield stays open for passes (i.e. cut-backs) of the opponent from lateral zones. Shakhtar’s players in deeper positions generally can’t react to this decisively anymore and the backward pressing usually can’t work close to the own box like it does higher up the field. The slightly advanced positioning of the ball-far winger can also become a problem next Shakhtar’s own box as it opens up a direct way for a switch from half-space to half-space for the opponent. Also runs from deeper starting positions aren’t followed consistently which leads to a vulnerability towards chip balls to the second post. Adding to that, the back four doesn’t cover the space behind their backs well enough in these situations but rather focuses on marking players in front of them. Shakhtar Donetsk would be a way less interesting team, if it only had some special or well drilled elements in pressing. The team of Paulo Fonseca also has a lot to offer in possession of the ball, beginning with the general structure. The base is a 4-2-3-1, a formation that is often interpreted as more of a 4-4-1-1. The wingers might tuck inside but more in relation to the respective full-back while striker and No. 10 interact with each other. Not so in Shakhtar’s case: They actually play with three No. 10s as attacking midfielders whose position is clearly between the lines. From there, they can still move outside towards the wing areas, but this space is never left unoccupied. Holding the width is mainly the job of the full-backs. Striker and the central No. 10 still position themselves in relation to each other for not being on the same passing line. But Ferreyra’s role is clearly different from Taison’s. He is the main option to be found when escaping from certain situations and acts according to the behavior of all three No. 10s. If we look at the deeper players, it’s also quite noticeable how both defensive midfielders oftentimes play very close to each other while the centre-backs spread out wider than them. Like that, they create a trapezoid which is narrower at the top than at the bottom and can also become a flat 4 at times with the centre-backs occupying the positions on the outside. Thanks to this, the defensive midfielders don’t block direct passes towards the outside midfielders and can be used to attract the opponent centrally by themselves. By doing this, they can even widen possible passing lanes. At the same time, the proximity of the deep midfielders allows quick interactions between themselves and can also facilitate a further progression towards Ferreyra or the players around him with the wing areas being an alternative route. Shakhtar doesn’t only have one structure to build up from. It’s more like a starting point to flexibly build a different staggering for implementing specific game plans or to execute actions based on the behavior of the respective opponent. It’s not a rarity to see Paulo Fonseca’s team lined up in what is basically a 3-diamond-3 with the full-backs playing a bit of a deeper role compared to the classical variation of it. Stepanenko completely drops between the centre-backs. Fred stays in the spot of the defensive midfielders while the two outside midfielders effectively become central midfielders. This 3-diamond-3 offers a fluent passage towards a 3-2-4-1 which is mainly related to the role of the central attacking midfielder. 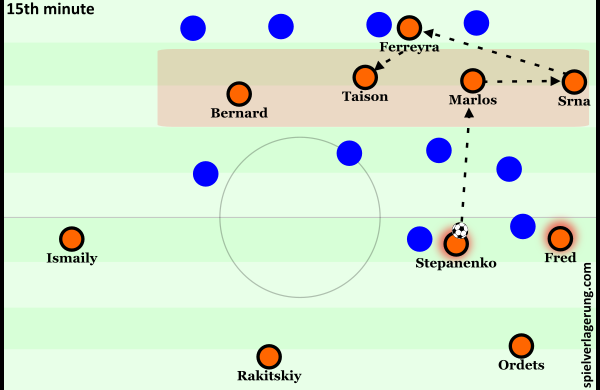 Taison (and also Bernard at times) likes to drop from this position while Fred stays a bit higher up the field and is able to also move to the side originally occupied by Stepanenko who once again positions himself between the centre-backs. These flexible build-up formations can be used to attract the opponent to wide areas to return to the centre from there. For that, the ball-near outside midfielder can drop for example, to create a diamond structure on the side which offers enough options to combine without changing the point of the attack. This can even be enhanced by Ferreyra also moving to the same side. In case of losing the ball, there’s always enough cover to win it back or to drop quickly. Because one defensive midfielder drops at the same time, the opponent wants to avoid backward passes to him. Moreover, three players hold their positions centrally as the ball-far full-back pushes up. 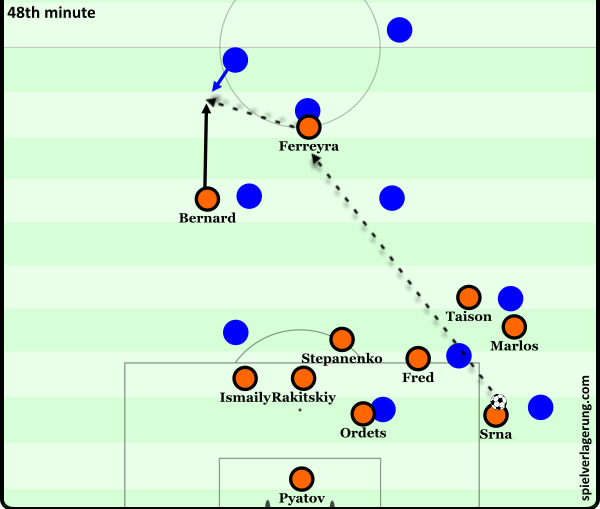 While maintaining a focus on the areas around the ball, Shakhtar creates enough outlet options away from it which adds difficulty for the opponent to defend. If they directly mark the defensive midfielder in the six space, there’s less access on the two remaining No. 10s in the centre. If all of them are covered right away, the ball-far full-back can be reached more easily. If he is marked too early, one of the other three players is open, once again. If the focus of the opponent on ball-far areas gets too big overall, Shakhtar will just progress through the same side anyway. This aspect can for example be exploited by a guy I already introduced: Yaroslav Rakitskiy. It certainly helps that he is proficient passing with both feet. At times, a lot of players surround him as the six space is a focal point in the build-up. The opponent tries to cut Rakitskiy off from this area which doesn’t bother him too much. After all, the Ukrainian likes passing in a wider range better and can for example switch the play from one half-space to the opposite wing. His flat passes from one half-space to the other are even more spectacular. Taison might specifically drop for one of these while his two Brazilian mates stay centrally higher up the field. If the opponent would now again decide too early to prevent a switch, a passing lane between the lines would open up for Rakitskiy and he can connect to Bernard with one pass for instance. From time to time, Andriy Pyatov can do similar things. The concept of attracting the opponent in one area to play towards another part of the field is rather transferred to a vertical layer in this case. For that, it becomes particularly important to hold the 2-2 or diamond structure of centre-backs and defensive midfielders. The goalkeeper needs enough options to progress via short passes on the ground as the opponent often reacts by directly marking the closest options. Thanks to that, the three players that occupy the space between the lines higher up can be brought into play even when a small gap breaks open. After one of them receives the ball, they can immediately interact with each other. A typical pattern would be for example that Marlos gets the ball and dribbles slightly inside while Bernard moves away from the defender in his blind side and creates an ideal angle for a diagonal pass. He can then receive the ball by himself in an open body position which allows for a dribbling into open space while facing the opponent’s goal. The other players in front of him even increase this advantage by attacking the space behind the back line (diagonally), pulling direct opponents or the entire back line with them. Attracting the opponents deep in central areas can also be used by Pyatov for high (chip) balls towards the wing. His execution isn’t always absolutely clean but also never totally atrocious. But still, it’s comparably easy for the opponents to access Ismaily or Butko in these situations. It can be avoided by creating options to quickly redirect the ball into the space behind the opponent’s full-back. Alternatively, one of the four build-up players can adjust his positioning in a way that an immediate backward pass is possible for the full-back. While focusing on attacking the space between the lines, Shakhtar doesn’t shy away from keeping the ball through passing towards their own goal until a good moment to progress arises. If the pressure close to the ball becomes too high and neither a controlled switch of play nor a combination on the ground is possible, there’s still another way to reach the next layer: Playing long balls towards Facundo Ferreyra. He positions himself to be the auxiliary option for just this and is able to use his skills to control and distribute high balls even against two or more opponents. Playing between the lines is not only for actually progressing centrally, though. It’s generally a common feature to create a free player on the wing through initial central progression. He can then, like Ismaily would do, move forward with the ball and dribble by himself or play back to the centre again, say diagonally towards the striker or horizontally to another free player (on the far side) between the lines. Compared to the player who receives a vertical pass between the lines, his team mate on the outside has the advantage to be positioned towards the field, facing the whole situation. His orientation starts quite early, basically when the pass between the lines is played. Thanks to that, he can choose a way to progress the game before anybody else. At the same time, the combination pattern of “up-outside-inside” leads to an ever-changing orientation for the opponents who almost need to turn in a (semi-)circle close to the ball in order to track it. 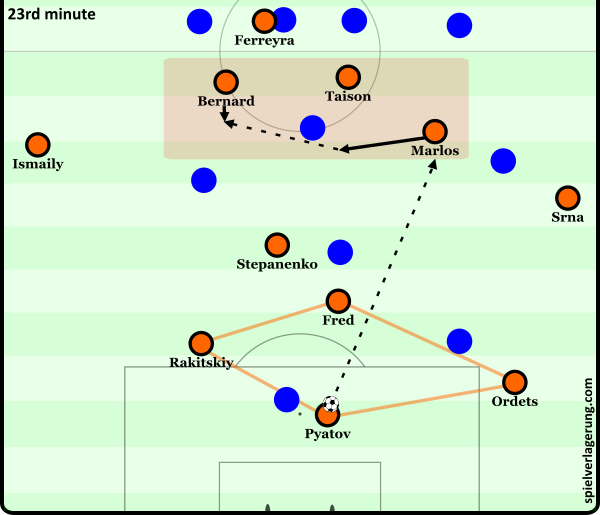 In this, another integral part of Shakhtar’s game becomes visible: The three attacking midfielders are, without question, strong in combination play but in the end, feel most comfortable when they can dribble with the ball. That’s why they also like to move into wider positions at times where they can solve a situational 1vs1 or 1vs2 without any problem. The diagonal play through the centre can also be used to play from one side of the field to the other relatively close to the goal. Ideally, an advantage on the far side can be created and used. The centre is something like a “hub” for the game which also is its most natural function. On the right side, Shakhtar then mainly looks for Marlos who likes to go a bit wider by himself early on. Butko then mostly overlaps from behind and both of them can create a dynamical advantage. On the left side the combinations are rather played in a triangle. On one hand, this is related to Ismaily being a clearly more creative and versatile player than Butko. On the other hand, the central attacking midfielder also tends to move towards this side of the field. Because Ferreyra can additionally occupy other players, quick combinations into the space between full-back and centre-back are a common way of breaking through. For possible crosses, Shakhtar occupies the penalty area quite well. The ball-far players tuck inside, Fred attacks from behind. This also allows Paulo Fonseca’s team to apply a situational counterpressing in those areas. This aspect of the game is one of the least developed at Shakhtar. Especially Fred and Stepanenko are generally pretty active after the team loses the ball, but the other players stay quite passive higher up the field. Individually one of them goes after the ball from time to time and it’s still not easy for the opponent to escape from such situations as the structure in possession is always tight enough to not allow simply passes away from it. But the focus is clearly on returning to the defensive structure as quickly as possibly instead of tying up the opponents in their own half. This fits Fonseca’s preferences quite well but nonetheless means some lost potential. If you look at the overall situation of Shakhtar Donetsk realistically, you’ll find a team playing at the peak of what is possible with the current roster. The key players are either already around 30 years old like Taison or close to move towards the next career level like Fred. The same could be true for the coach himself: Paulo Fonseca’s contract runs out at the end of the season. An extension isn’t very likely due to the overall situation and also because the good performances in the Champions League already caught the interest of bigger clubs. For example, Fonseca could be quite a suitable successor for Diego Simeone at Atlético Madrid, if his era there will really end, soon. The Portuguese would likely implement a lot of features against the ball that resemble the ones already put in place by Simeone while being able to enhance the possession game with some fresh ideas. As somebody who isn’t your typical positional play coach but rather obsessed with being clearly organized in all phases of the game he would be an ideal fit for the working-class DNA of Atlético. At the same time, he would find players in Madrid capable of doing at least the same things that Shakhtar does at the moment. His current team is still in contention to advance to the Champions league quarter final or for even more. Neither Roma nor any other opponent that Shakhtar could face afterwards should underestimate the team from eastern Ukraine. Only because Shakhtar doesn’t look like a powerhouse on the surface, it doesn’t mean that they can’t be successful internationally.